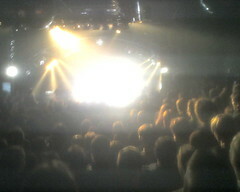 I went to see Black Rebel Motorcycle Club play at the Markthalle* in Hamburg. Hi-res pics can be seen here. 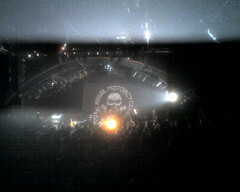 It was one of the best rocking concerts I have seen in a long time. The droning/searing guitars along with the light show helped create a very mellow groovy atmosphere. If you are into early Verve, The Stooges, Spiritualized or Black Sabbath, you might like Black Rebel Motorcycle Club. And if your kitchen table has a hole in it where a doorknob used to be, you might be a redneck or something. *Look who else played at the Markthalle last month.